The action is heating up for our Task Force and partners! 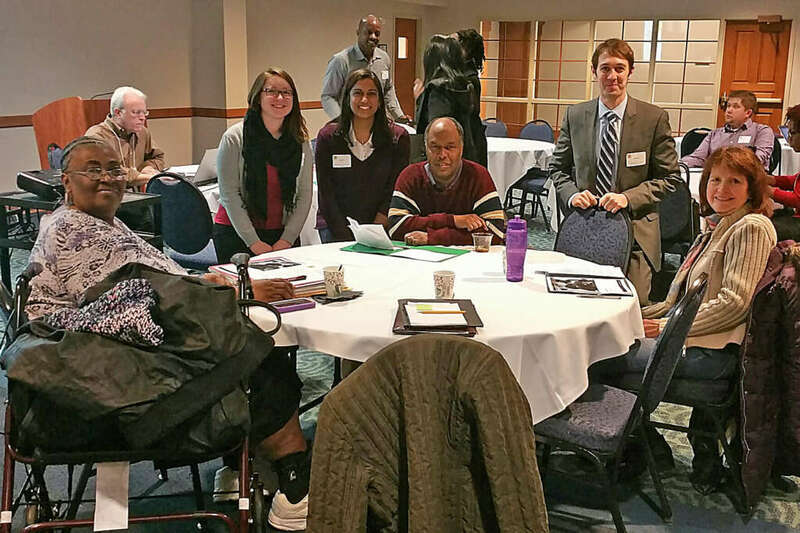 On April 5th, Task Force members CJ Jones, Ginny Middleton, Brenda Stubbs, and Rochelle Habeck car pooled to Lansing to attend the Michigan Power to Thrive (MPTT) Summit on Alternatives to Preschool and Early Care Expulsion, where we joined our partners from the Learning Network, Melissa Fish, Jared Volz and Sakhi Vyas (see picture). After viewing a portion of Wounded Places from the Raising of America powerful videos, we heard from speakers regarding the legislative landscape, drivers of the problem, implicit bias, economic inequities in access to child care, stories from parents who have experienced expulsion of their children from early care and education, and a very successful intervention that has been de-funded by the state legislature in the state budget (Child Care Expulsion Prevention – CCEP), the unmet mental health needs of children and more about trauma-informed care. At the end of the meeting, the assembled group voted to adopt a campaign as follows: To ask our state legislators, as part of the Third Grade Reading Initiative, to reinstate funding for Early On, including reinstatement and funding for Child Care Expulsion Prevention, and make it available to parents and providers in every county to prevent expulsion from early care and retain children in successful preparation for kindergarten and reading proficiency by third grade. Please join us in this advocacy when the email is sent out. As we announced last month, our task force has selected as our issue the need for Trauma-Informed Care, Services, and Education to address more effectively the issues and needs of children that result from trauma and the chronic stresses of living in poverty and racism. At our March meeting, we heard a presentation from Nancy Mitchell, a therapist with Family & Children’s Services who is contracted by Communities in Schools and KC Ready 4s to consult, model and assist teachers and care givers in providing trauma-informed care/education in after-school and preschool programs. She gave examples of the kinds of behaviors that children who have experienced traumas and chronic stress may elicit which can cause reactive and punitive responses from adults and escalate and cause further damage to the children. Then she demonstrated how to respond and not react to the behavior, how to connect with the child, not take the behavior personally and listen carefully to the child, how to help the child relax (e.g., with mindfulness breathing, sensory exercises), and to be consistent and predictable. These responses help the child learn how to regulate their emotions and how to develop and sustain positive relationships. She explained how chronic stresses and traumas impact brain development that leads to these behaviors and impedes learning. On a final note, we can no longer ignore what the data are telling us. Racial disparities begin in infant mortality rates, continue in expulsion rates from early care and education, continue in K-12 achievement and graduation rate, and into mass incarceration. The need to address the causal factors embedded in our culture that put children of color at special risk cannot be denied. The data show us that race and poverty are major public health hazards for our children. Please Note: The next meeting of our Task Force will be the third Monday of April – April 18th, 5:30 to 7:00 pm at St. Luke’s. Please join us! On Thursday, April 14th from 3:00 to 5:00 at KRESA West, the Early Childhood Policy Group (from the Raising Kalamazoo County partners) will meet. Here is an adaptation of reflections from CJ Jones after the Summit: The real solution may be to examine the behaviors more in light of the history of the student that’s perpetrating them. In fact, a child’s tendency to act out may just be a symptom of trauma that is going on in the home–whether the child has been through sexual, physical, or other forms of abuse or neglect, the death of a parent or some other well-loved relative, or a cluster of multiple events that these children have not yet developed coping mechanisms to overcome. Other examples of trauma stem from the impact of chronic stress due to instability in the home–such as parents fighting or neighborhood violence, income instability and loss of housing or food scarcity– that may reflect in children’s behavior. The behaviors should not be ignored, but addressed with healing approaches and resources.